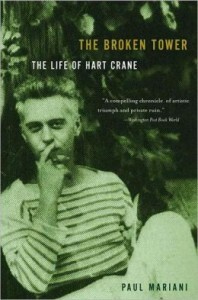 I arrived at Mariani’s biography courtesy of Harold Bloom, who of all living critics must surely have the deepest and most abiding love for Hart Crane, having discovered him when he was only ten years old. Crane is a haunting poet. His verses, though difficult, have the uncomfortable habit of staying with you, bouncing around in your head, welling up at the most unlikely of times. I summon Shakespeare; he comes to me because my mind is associative and connects specific circumstances in my life to choice quotes from Lear or Hamlet or the sonnets. Crane, on the other hand, materializes, often without my understanding why. This is what it is to be haunted, and this is what inspired Mariani to be both a poet and a biographer. The Broken Tower: The Life of Hart Crane reads like a novel, beginning with Crane’s birth in Ohio in 1891 and ending 32 years later with his suicide. So, in brief, Hart Crane’s life: he was born in Garretsville, Ohio, to a wealthy father and an emotionally erratic mother. His father never showed much understanding for Crane’s poetic ambitions, choosing instead to measure his son by the standards he held for himself: industry, ambition and independence. Crane was doomed from the start to be a failure in his father’s eyes. His mother, on the other hand, showered him with affection and openly endorsed his poetic career, but hers was perhaps no less nefarious an influence. Unable to detach herself from the need for her son’s adoration, Grace Crane smothered her son, attempted to mold him into a kind of emotional crutch. Sensing, on some level, the danger his parents represented to his development as person and poet, Crane gathers together some funds and arrives in New York when he is only seventeen, without having completed high school. New York in the 1920s, as Crane soon discovers, is a mecca for artists and aspiring artists, and his acquaintances come to include the poets E.E. Cummings, William Carlos Williams and Marianne Moore, the playwright Eugene O’Neill, the actor Charlie Chaplin, and literary critics as various as Allen Tate and Edmund Wilson. New York had more than its literary promise to attract Crane: he fell in love with the architecture, with the skyscrapers that glowed white in the dawn’s light, and with the magnificent Brooklyn Bridge, completed only six years before Crane’s birth, and on which he would walk and admire his city. Crane was also gay, unbeknownst to his parents only, and the city provided enough sailors to sate his appetites. He could often be seen strolling the docks or navy bars, a rugged and handsome young man eager to share his bed and seldom disappointed. Surely one of the most enduring images of Crane, provided in one of his letters, is of the young poet standing atop Brooklyn Bridge as a navy flotilla passes beneath him, prompting him to boast that he has “had the whole Navy” between his legs. Mariani is a poet himself, and he brings to bear a poet’s sensibilities, locating Crane’s words within the events of his life in such a way as to illuminate the poems. Crane’s famous opacity yields somewhat to Mariani’s interpretations and biographical references, and this, alone, should make this a worthwhile endeavor for readers of Crane. But the real achievement is in constructing a biography that is sensitive to Crane without embellishment or speculation. We emerge feeling we have known the poet, shared in his victories and defeats, and this is no mean feat – for a poet, novelist or biographer. I will not mince words: this is the single most affecting work of non-fiction I have ever read, and the first in some time to leave me in tears. Mariani ends his narrative shortly after Crane’s death, when the young poet, penniless, discovers that his last and perhaps strongest poem, “The Broken Tower,” has been rejected for publication. The final image of Crane, drunk and dejected, staggering slowly towards the side of the boat that would have taken him back to New York from Mexico, carefully folding his blazer atop the railing and then, in one fluid, athletic motion, vaulting himself over the side and into the deep, in full view of many of the boat’s passengers, will haunt me all my life. Hart Crane, the poet of White Buildings and The Bridge, died in the belief that he was a failure, that the poetry he devoted his life to creating was without merit. “My Word I poured. But was it cognate […]? Crane asks in “The Broken Tower”: did my poetry share the power of the church bells? was it of their strain? could it, too, provoke and summon the hearts of men? This is an essential book befitting an essential poet, at once an account of the unchanging struggles of the artist pursuing his craft in the face of economic ruin and a paean to one of literature’s most original voices.